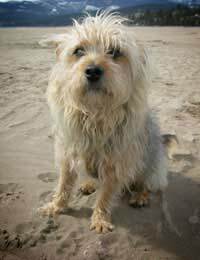 When travelling with our pets to coastal or riverside areas we should be aware of the dangers that face our family friends. Being vigilant means that your family can enjoy themselves without fear of accidents spoiling an enjoyable occasion. Pets are not allowed on many beaches during the height of the summer holiday season. Check local bylaws before setting out so as not to spoil the family’s vacation. Making sandcastles and digging holes is a common pastime on the beach and as many dogs like to dig holes they may well join in with the family’s enthusiastic games. Unlike humans, dogs are not aware of the danger of deep holes dug in unstable soft sand. If your dog is likely to be over enthusiastic in his digging pursuits keep him on a long lead so that he can be hauled to safety if danger rears its ugly head. Many items can get wasted up on the shoreline. Used needles, containers with unknown contents as well as rubbish thrown from boats and left by holidaymakers. Dogs especially are very inquisitive and can be harmed by sniffing into rubbish, picking up decomposing fish and chewing on strange objects.Wasps are attracted to beach visitors as they picnic on the beach. Humans know to avoid these winged aggressors but dogs will happily chase and snap at the wasps until they are stung. Some dogs, like humans can have a severe allergic reaction to a sting but usually is the sting is on the face or body the dog will leave it alone after a while. Stings in the mouth can cause the tongue to swell and possibly block the animal’s airways. A solution of vinegar or water and baking soda should stop the swelling whilst you find veterinary help. Official beach guards can help as they are trained in basic first aid. Jelly fish are a danger to both human and dogs on the beach, dogs more so as they do not understand that these strange creatures should be left alone, if stung a liberal sprinkling of vinegar will take the sting out. This works for humans as well as pets. Another way to remove the sting is to soak the area with urine but this is not always to hand when needed! Dogs love to swim and play in the sea. If the sea is rough or the warning flags are raised do not let your dog even play at the water’s edge as the lure of the waves is enough for him to jump in and be washed away. The pull of currents can also take you dog out of reach when swimming. A long lead or even a washing line attached to his collar will keep your dog close and he can be dragged to safety if the sea suddenly becomes too dangerous. Dogs are often seen on sailing boats and canal barges and enjoy a holiday on board as much as we do. The safety lines used for children (and adults) can also be used to anchor a dog to the boat when weather is rough. Never encourage your dog to dive from the boat as danger from currents, other craft and the pull of your own boat could sweep him to his death. Just as we wear buoyancy aids when sailing so there are now many makes of these aids for our pets. Designs vary to suit the size and shape of our pets and come in bright colours so if a pet should fall overboard he is easily recognised. Not only will they keep a pet afloat but a handle sewn into the buoyancy aid means that the pet can be hauled aboard and rescued hopefully without too much mishap.